Seeing the Taj Mahal in photographs or movies you can never imagine its grandeur until you see it in front of you. The mausoleum totally overwhelms the visitor with its imposing structure and majestic beauty. After the first glimpse of Taj Mahal and the tips for travellers, the optical illusions, mysteries and secrets of the mausoleum and the unique facts about the tomb's pinnacle, this is the fourth part of the travelogue in which I'd focus on the the final resting place of Shahjehan and Mumtaz Mahal--their graves inside the Taj. At the gate, there was a board on which it was written that photography is not allowed once we step inside the tomb. Till now, I had clicked enough photographs on the premises, platform and around this masterpiece of world heritage, marvelling its beauty and architecture. Naturally, the graves couldn't be up there at such a height. This is the reason that the original graves are at the lower chamber, the entry to which was stopped some years ago. The imitative graves are similar to the real sarcophagi located in the basement. The dimensions are same but not the craftsmanship. Though there is lot of security but when you see people still writing their names and making graffiti on the milky marble--damaging the structure, without any concern for our national heritage, you feel that restrictions are necessary. At the Humanyun's Tomb [Humayun was Shahjehan's ancestor, great grandfather to be precise] in Delhi, which was built long before Taj Mahal, there is similar arrangement at the sarcophagus--decorative grave at ground floor, real grave in lower storey [underground chamber]. Due to these cenotaphs in the middle of the upper chamber, those walking around won't have their feet over the real graves. So there is no disrespect to the graves that are directly below this chamber. In the upper chamber, where visitors are allowed, you see light filtering out through screens and glasses. Shah Jehan was later buried here and hence his grave is situated a bit towards the left. As usual, the graves of male and female can be distinguished when you see the top of the 'qabr'. Shah Jehan's has a 'qalamdan' [pencase or quill box] on it. "...The arches of this central octagonal hall amidst which lies the exquisite eight side marble network, are made of the finest marble. In fact, so chaste that when the rays of light scooping through the double perforated marble screens fall on it, a sort of miracle occurs, because it seems that this marble has been thinly coated with sang-i-tila or gold stone, the precious particles of which have been set in its smooth texture", writes Dr WH Siddiqui, the former Director of ASI. "The front of arches apart from masterly calligraphy comprising quotations from Holy Quran are embellished with the most gorgeous ornamentation in the form of plants, bouquets, buds opening and closing, blossoms partly blown or in full bloom, and leaves bent by the breeze. They are so natural and true to life that unless observed closely it is difficult to discern that they are composed of pieces of precious stones so firmly and elegantly embedded in the marble". "It is amazing but true that an ornamented marble panel depicting a bouquet of flowers contains several hundred pieces to form the mosaic work, and in a single flower there may be as many as fifty pieces of valuable stones of bright and natural colours, what is more, these pieces are closely and accurately embedded that it is impossible to pass a needle in the parting", the book further says. 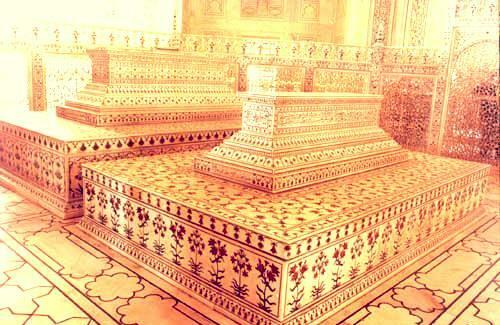 There is a lot to see once you are inside the tomb but you should have the eye to note the intricate details. Always remember that when you get inside such structures, have a look at the ceiling, you must have the eye for details, the inquisitiveness of a traveller and must ask the guide about the artwork. Surprisingly, here also the visitors were throwing coins--at the mazaars! The then Emperor of Hindustan who commanded unprecedented wealth must not have ever imagined that a few centuries later people would throw metal coins at his 'qabr'. In fact, there is Urs also in memory of Shah Jehan, just like Sufi saints' are remembered and the Urs is held to mark their anniversaries. Once a while, a person tries to take a snap of the graves inside the Taj, but the security personnel inside are alert and immediately stop them from photography. There are interesting aspects about the reflection of light and the sound affects inside the tomb. You may spot the signature of the master calligrapher, in case, the guide tells you and if you can read a bit of Perso-Arabic [Urdu script]. You may as well find the word 'Bhola' written in devanagari somewhere there. There is the story about the lamp, a gift from the British lieutenant governor who visited the tomb in 1909 and many other tales. 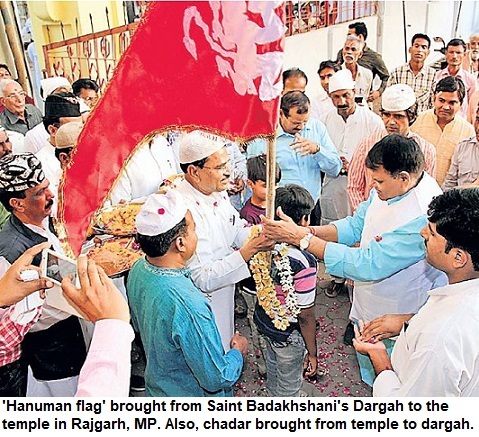 We have skipped a lot including the death of Mumtaz, how she had died and buried first in Burhanpur and later the body was brought and buried here. 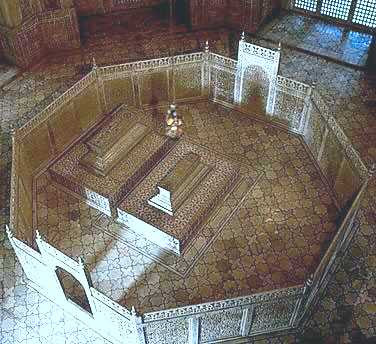 We haven't even talked about the Char Bagh garden, the mosque, the Basai tower, the turrets, the waterworks--all that formed part of this mausoleum complex which was made on lines of a paradise for Mumtaz Mahal on earth, before her final destination--the heavenly paradise. I have earlier mentioned a few of the illusions in the structure but I forgot to write about the optical trick about Taj's size when you see it from the main gateway--its getting bigger suddenly in a matter of few steps. But the travelogue continues. Next on when Taj was just saved by a whisker. 3. Have you seen the finial on the Taj's dome, know its height? Taj Mahal taller than Qutub Minar.